Birmingham, Alabama, native Justin Carter says his UNA degree has taken him places well beyond Alabama and his professional expectations. Since earning his Bachelor degree in Business Administration in 2003, he’s held positions with Aon Hewitt as a Human Capital Consultant where he spent three years in Washington DC on assignment with the Department of Defense and Homeland Security, lived in Chicago for a summer while consulting for Chrysler Automotive in Detroit, and earned a Masters degree in Leadership before accepting a position as an Organizational Development Business Partner for Vulcan Materials Company, where he presently works. Justin is also pursuing a PhD in Human Capital Management from Bellevue University. “I honestly thought I would transfer after my first year,” Justin said. “But I fell in love with UNA and never looked back.” Both of Justin’s parents attended UNA and he hopes his daughters, ages two and 11, will make the same decision. “I’ll let them decide for themselves when the time comes,” he said. “Though I’m not saying I won’t plan a few trips to Florence before then.” The girls have already visited the campus multiple times. Justin was a member of the UNA cheerleading squad for two years while attending undergrad, a fact his wife likes to tease him about, but he says he wouldn’t change a thing about his UNA experience. 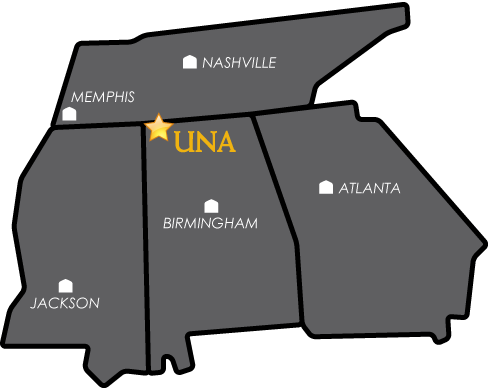 A life-long enthusiast, he’s even converted his wife, a UAB alumna, into an avid North Alabama fan. He was a member of Phi Gamma Delta, as was his father, and Justin was the first legacy of the UNA chapter. “The older I get, the more I believe that your network is really your net worth in this world,” he said. He credits UNA with providing a foundation upon which he has built a successful life and career, pointing to statistics courses particularly, but also classes on human behavior which he's used extensively in his current and previous positions, and courses that fostered strong communication skills he has found critical in the business world. He credits Dr. Neil Thorne for having made a lasting impact on his career path. “I changed my major while taking his supervision course,” Justin said. “He would stay after class as long as I wanted to talk about human behavior and different theories on motivation. The subject fascinated me, and I turned that fascination into a career. I owe Dr. Thorne a lot of credit for my success. He still inspires me. Join Justin in connecting with other College of Business alums on the COB Alumni site.